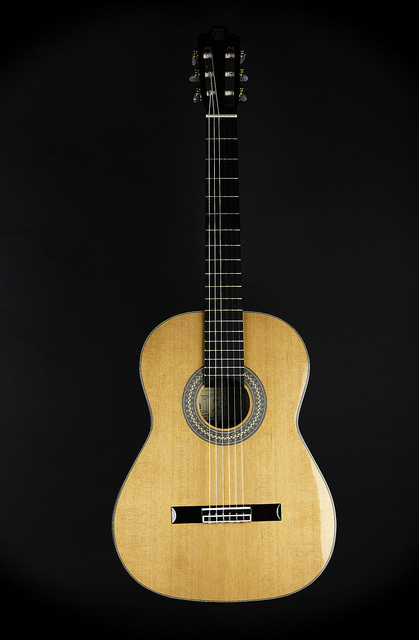 So you’re in the market for the best classical guitar? Whether you are picking up your first instrument or finding another to add to a diverse collection, there’s no way that you want to waste your money on something that isn’t the best for your price range. There are thousands of different guitars out there and it can be a little overwhelming trying to find one that works best for you. Never fear, because to aid in the boring process of wading through reviews, let’s find the Best Classical Guitar right now! Let’s start this list off with a handcrafted European guitar(made in Bulgaria, to be exact). The Kremonia Solea is a quite beautiful creation, so it’s draw will give you an eventual goal to strive for. It sports a body made of Cedar on the top, while the sides are Central American Cocobolo. Why does this matter? The material of a guitar is essential in making the sound resonate in the open and to give it a nice tone. This one however, has a glossy finish on the body that causes the tone to sound a bit trapped. The Ebony fingerboard and Hondouran Cedar neck make playing an absolute joy. The smoothness of these woods make changing finger positions much easier. The Solea sounds amazing when playing softer and slower songs. If you wanted to cover Perfect by Ed Sheeran or Too Good at Goodbyes by Sam Smith, this would be a great choice. Next up is an interesting one. La Patrie is a Canadian manufacturer of Nylon string guitars exclusively, and they’re pretty good at it. In their own words, their guitars are made to sound better the more they are played. The body consists of a top made of 800 year old Cedar (not kidding, these trees are ancient). Similar to wine, this aged wood gives the guitar a specific tone and outstanding resonance. 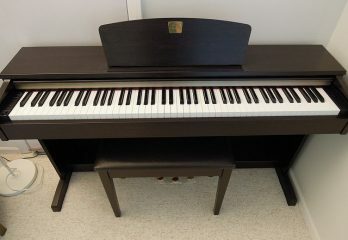 The sides and back are a sheet of Poplar wood sandwiched between two pieces of Rosewood, which adds to the tonal quality. The Presentation has a few interesting electronic addons included in it. On the side are three knobs that can be used to shape specific frenquencies of the instrument. 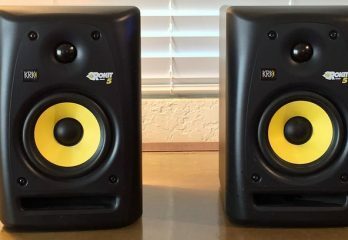 Want more low end? You got it! Also included in that same QI electronic setup is a built-in tuner. Use this to make sure all of your strings are set to the right notes for your music. If something is wrong, be ready to deal with less than perfect customer service from La Patrie. The Cordoba C9 is slightly smaller than most of the guitars on this list, but don’t let that fool you into thinking it doesn’t pack a punch. Handcrafted, the C9 is built with the same (potentially more) care as its competitors. The combination of a cedar top and mahogany back give this guitar an amazingly warm and bright tone. Boy, does this guitar like to show off. It has a Mother-of-Pearl Esteso rosette inlay that adds the same amount of jaw-dropping looks as the set of gold tuners. Overall, this guitar could pass as a piece of art even if no one was playing it. But that’s not all! The C9 is good for any experience level due to how playable the Mahogany neck is. 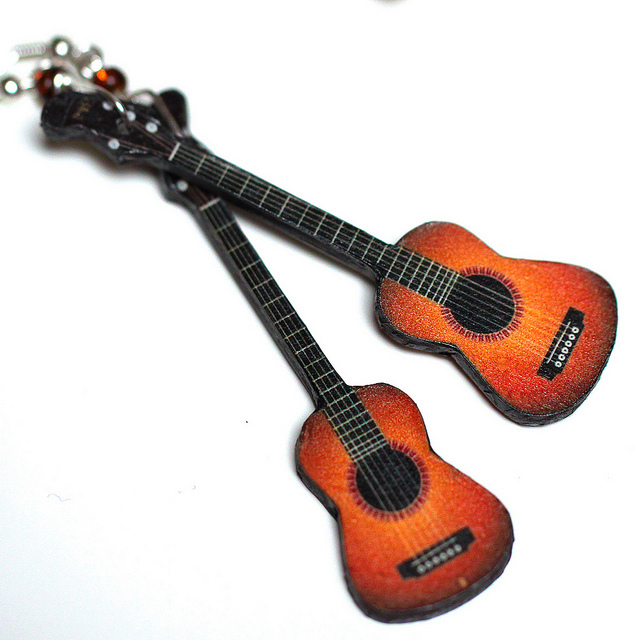 The tension on the strings isn’t too taut, so you don’t have to worry about having to press to hard with your fingers. The easy-to-maneuver Rosewood fingerboard makes this even easier. The length may not be the best for people that could be confused for basketball players (height-wise). I’ve never played Flamenco style guitar, but this beauty sure makes me want to give it a try. Brought to you by the same company as the first guitar in this list, the Rosa Morena has little design choices scattered around it that make you appreciate its intricacy. On the head of the guitar, above the bone nuts and gold machines are small, gold lyres with an incredible amount of detail. A clear pick guard is on the body to ensure protection from the roughest of players. For those of you that fancy using a pick, this model comes with a clear pick guard to keep the finish looking spectacular. Brace yourself. The NCX 1200R is our first offering from Yamaha, a company whose name is associated with pianos and guitars. Their popularity must be due to good products, right? Well here’s the deal: This is a great guitar for all styles. It is able to capture the essence of traditional Flamenco style while also being great for other genres you could be interested in. The added technology helps with this. 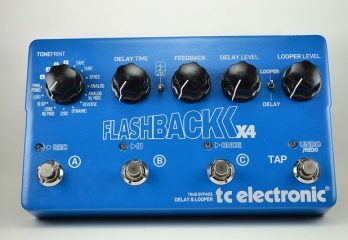 It comes with a small-scale 3-band EQ system that can alter the tone of the resonance. An awesome feature of the wood is that it is treated with Acoustic Resonant Enhancement, which allows the body to adjust slightly to different settings. This was developed in-house by Yamaha, and really gives them a leg up from the competition. Yamaha’s other innovation is the Acoustic Resonance Tracker pickup system. Believe it or not, the system taking care of this gets one of the purest acoustic to digital signals out of any instrument on this list. Our second offering from the good lads at Yamaha is another Acoustic-Electric guitar. It’s an electric version of the GCX122MS model. Yes, one letter can make that much of a difference. This model houses the same Acoustic Resonance Tracker pickup system as our previous offering. This guitar features a cutaway neck to aid in the access of the higher frets. Consider it a visual distinction of the model, because most classical guitars do not have it as a feature. You can think of this as a cheaper version of the NCX 1200R. The body is made of Nato, which is normally used as a replacement to mahogany or other hardwoods. There is no inlaid design around the sound hole, it is just a piece glued on top of it. Like the NCX 1200R, this is a great guitar to use for direct input. 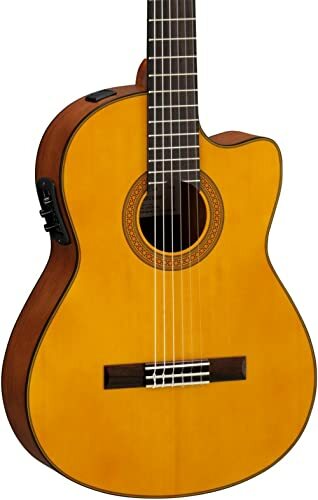 Especially if you don’t have access to a good recording microphone, these types of classical guitars are ideal because you can just plug them into an interface and record that way. 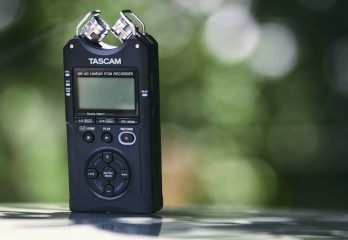 The sound quality may not be a perfect match to analog recorded guitar, but the difference is only by a slight amount. 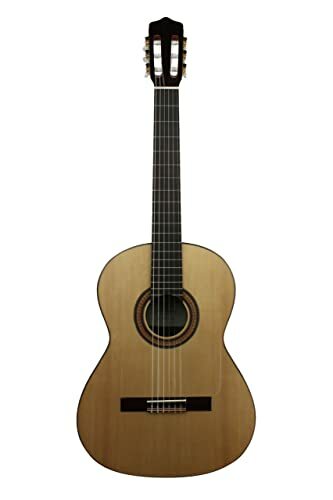 Considered by many as the perfect beginners guitar, the Cordoba C3M is the perfect place to start if you are first getting into the instrument. 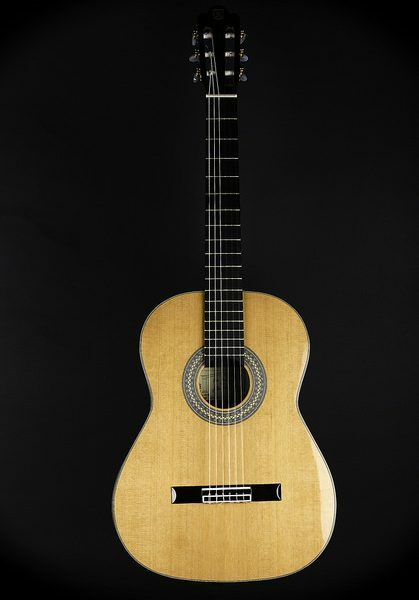 This is a full scale classical guitar that has a simple design, but one that doesn’t detract potential players. The top of the C3M is made of Cedar while the rest of the body is a rich Mahogany with a Satin finish. These combined woods create a rich sound with a good amount of resonance while keeping the instrument light. The neck is nato with a rosewood finish. Fun fact about the name: The “M” stands for the matte finish the classical guitar has. Coming in as a great entry-level classical is the C40. Due to marketing itself at that standard, this guitar shouldn’t be looked at as the Taylor or Martin of the classical guitar world. However, for beginners this is an incredibly crafted guitar. The body consists of a Spruce top and Meranti body and sides. On the side of the neck, there is a single dot marker at the 7th fret to work as a reference for beginner players. The C40 has a bright, snappy sound to it which gives a tone that will bring beginners back, eager to practice. The Ibanez GA3 is a long-lasting, affordable classical guitar that takes away all of the less necessary and costly components to offer amazing tone and fit into anyone’s budget. While not on the same level as brands like La Partie and Cordoba, Ibanez beings a pretty solid offering to the table. Read on for more info. The key to its distinct tone is a combination of the Spruce top and Calpasta back to make a quality body. The Rosewood fingerboard and overall construction lend to its ease of play. The red headstock demands attention and the hardware attached to it are durable and ensure longevity of your strings. You won’t have to worry about fret buzz on this one. Ibanez have done a great job reducing the amount of tweaking you would need to do to get the guitar to sound better. Some might say the quality of the tone out of the box is a step up for Ibanez, but regardless of their previous pursuits, the GA3 can stand toe to toe with any beginner budget guitars. Rounding off the list is the Stagg C546TCEN Cutaway. The guitar community is fairly divided on the use of Stagg products, but this classical guitar stands as a fantastic product. 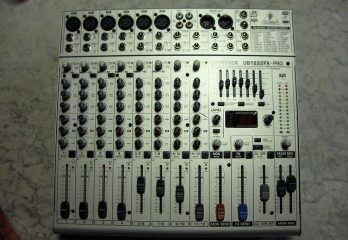 It comes with a B-Band Electronics 4-band EQ and a tuner, which gives it even more tone control than the Yamaha guitars on this list. It has a digital display that helps you determine whether you are in tune or not. Stagg manufactured this guitar with a Spruce top and Catalpa back and sides. The neck is Catalpa as well, but the fingerboard is made of Rosewood for a smooth playable surface. 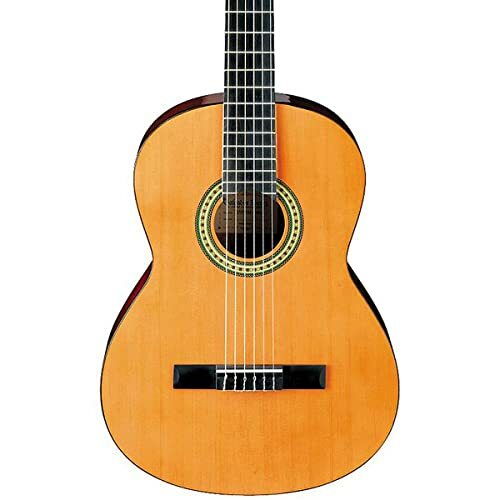 This classical guitar comes with a high gloss finish and Lyra Gold tuning machines. Now that you’ve made it through the list, you may be wondering what makes these types of guitars so great. 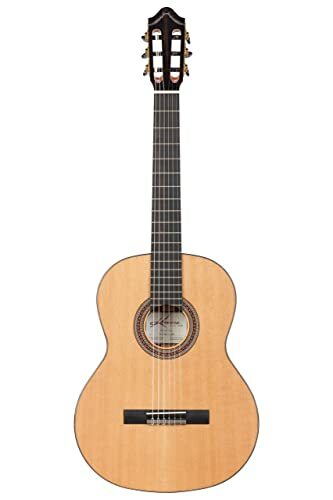 When it comes to Latin and Flamenco music, classical guitars are one of the signature sounds. Players normally perform these genres using just fingers and no pick, so players can control their volume and tone much more than someone using a pick. 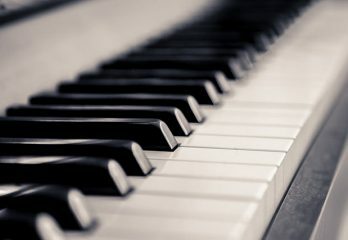 These changes allow for a greater range of emotion while playing, in the same way that a piano player can channel a lot of emotions through their keys. Another factor of playing classical guitars is that they are much more forgiving on your hands. Nylon strings are incredibly soft compared to bronze or nickel strings, so they don’t cause your fingers to bleed or your calluses to flake after extended periods. The best part? Learning classical guitar is a very skillful path. 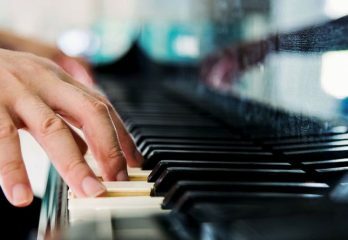 The dexterity to move all of the fingers in your right hand to pick specific notes in a chord takes a lot of time to master. But when you do, there are very few styles that will be out of your reach. Some of the most professional guitarists in the industry had their start through learning classical guitar. When it comes down to picking the type of guitar you want, your best bet is to find a method to sit down and play the type of guitar you are looking for. 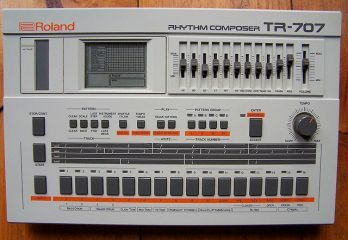 After all, finding an instrument to invest a considerable amount of time into should be a serious conquest. Even if you are planning on releasing music, finding a guitar that sounds good to you is more important than one that is objectively better because there is always the chance you won’t be able to get your emotion across with the better guitar. If need be, find a player at your local store that could try out the guitar for you if playing in a semi-public setting is somewhat uncomfortable or you are still new to the instrument. Once you have played a few guitars, you will start to notice trends with specific types of wood. Mahogany is the most balanced type of wood and doesn’t really affect the sound of any frequencies of the instrument. Other types, however, change the sound quite a bit. Alder is great for having a lot of body in your sound. It causes lower frequencies to resonate better. If you tend to favor bass notes integrated with your classical playing, look no further than Alder. Ash body guitars have a very nice twangy sound to them, and are ideal for brighter music. Cedar is a bit more complicated to produce and requires a practiced hand, but it more than makes up for it in tonal quality. There are many other types of wood used to create guitars, but a good rule of thumb is to think of heavier materials as having a boost to low frequencies and lighter ones for a more bright sound. Fortunately, when it comes to the strings you’ll only have to worry about nylon because playing classical guitar doesn’t usually entail using strings with other materials. For the professional or long-term musician, or even a beginner looking to start at the top, I would have to say you should go for the Yamaha NCX 1200R. This guitar is an amazing instrument in all categories, as well as implementing Yamaha technologies to add other utilities that will save you money in other areas. The ability to record with DI stops you from being limited to only microphones, and the instrument is truly gorgeous to look at. 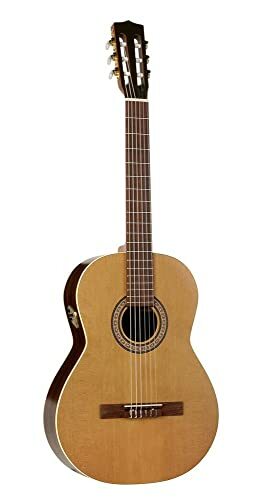 Without a doubt, my opinion is that the Yamaha NCX 1200R is The Best Classical Guitar. Seagull S6 Review 2019 – Is This Acoustic Guitar For You?